Norway’s natural beauty is majestic and her history is captivating. The Northern Lights. Deep fjords cutting through rugged mountains. Vikings striking terror. 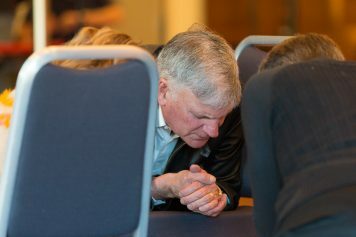 But it’s another sort of indelible impression—a piercing of the heart—that many churches in Oslo have prayed would touch those who attended Saturday night’s Håpets Festival (Festival of Hope) with Franklin Graham. How do you pierce or change someone’s heart? But at the Oslo Spektrum arena, Franklin Graham told 4,300-plus people that the human race is running from the Bible and all things of God in pursuit of contentment. Franklin Graham kneeling in prayer before the Festival. Though Christianity was adopted in Norway about 1,000 years ago, today only 4 percent of Norwegians attend church regularly. 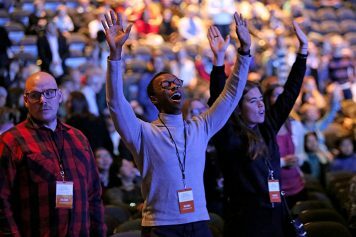 As the country becomes increasingly secular, many—millennials especially—have replaced their need for God with social justice. Finding a cause to get behind. Gilles Gatete, a counselor at the Festival, said the lack of purpose among millenials in his city is rampant. Gilles said many join environmental groups or vegetarian groups, or they find something else to belong to. There’s nothing wrong with these things, he said; it’s just that young people are trying to fill their emptiness with temporal things. Franklin Graham talked about how mankind was created with a longing for it’s creator—God. Gilles Gatete is passionate about sharing his joy in Christ with the lost in Oslo. Many, he said, just come home from work or school, sit in front of the TV and are depressed—wondering about the point of life. Another counselor, Belinda, prayed with a young woman who recently discovered what she was missing. She had committed her life to following Christ before coming to Norway to visit a friend. She heard about the Håpets Festival after arriving, though, and when her friend wanted to go party, the young woman listened to the nudging inside her heart. She attended the Festival instead and walked forward to rededicate her life to Christ. Knowing Jesus is “amazing,” she said. She told Belinda she knew the Holy Spirit was prompting the change in her life. “I want this,” she affirmed. Dozens of other people decided they wanted this, too—living life on purpose for Christ. Hearts pierced with the truth of the Gospel. “The Bible says by grace we are saved by grace through faith … and it’s by faith in His Son Jesus Christ,” Franklin Graham told the arena full of people. Gilles is on the same page. “There’s power in the Gospel to change a [person’s] situation,” said Gilles. “By responding to the Gospel we become sons and daughters of the King and we understand that God has a purpose for this world. Then we redirect our purpose. “Our dream is to fill Oslo with house churches. Like the stars in the heavens at night. That every corner of Oslo be filled with Christians who are salt and light,” he said. So even though the world is changing and ever more secular, life’s purpose always comes back to God, said Franklin Graham. Are you searching for purpose, too? Start here.